The seizure is believed to be the largest bust of an alleged cockfighting outfit in Massachusetts.Hundreds of roosters might have to be euthanized after Northampton cockfighting bust. Birds rested in their cages on Tuesday. Nearly 400 birds were found in an illegal Northampton cockfighting pit last week. Most of them will have to be euthanized. NORTHAMPTON — In August 2014, Ravenwold Greenhouses appeared to be the picture of a quaint New England farm. That verdant scene was a far cry from what Northampton police detectives, armed with a search warrant, discovered Thursday when they raided the 58-acre farm and seized nearly 400 roosters “purposefully bred for cockfighting,” a vicious blood sport outlawed in all 50 states, according to a statement from the MSPCA, which is investigating with police. The seizure is believed to be the largest bust of an alleged cockfighting outfit in Massachusetts. As of Tuesday, no charges had been filed in the case, police said, but the probe was ongoing. “Our understanding is that there was a small ring set up in one of the buildings with some blood splattering on the ground — but it didn’t appear as if fights for money were taking place on the property as there was no room for spectators — so it was likely a training ring,” said Rob Halpin, a spokesman for the MSCPA, in an e-mail. The group said the birds seized from the farm were brought to MSPCA-Nevins Farm in Methuen, and they’ll have to be euthanized. The MSPCA said 45 rooster chicks, though bred for fighting, might eventually be adoptable, and about 100 hens will probably end up in sanctuaries or homes when their medical and behavior checks are completed. Paul Duga Jr., the owner of the Northampton farm where the birds were seized, said Tuesday morning that he’s not involved in day-to-day operations and hadn’t heard about the raid. “Mainly, they grow flowers there,” Duga said. “They basically grow flowers and vegetables. They have other stuff; they have livestock” as well as chickens. He said the farmers also rent space to vegetable growers. “It’s a typical little farm that’s struggling to survive,” Duga said. A man who answered the phone at the farm Tuesday declined to discuss the case in detail. Later, at the farm, a man who identified himself only as “Mr. Adams” said he didn’t see any police on the property last week. The man said his family leases the land to other tenants and they’d never had any problems previously. He also claimed there were no roosters on the farm; yet as he spoke to a reporter, a rooster was heard crowing in the distance. Meanwhile, at the MSPCA-Nevins Farm in Methuen on Tuesday, the rescued roosters were taking up two floors of the barn. A number of roosters were placed in small crates on the first floor. Additional roosters were being kept in cages on tables on the second floor. The birds periodically broke out into rooster calls that could be heard from outside the barn. Volunteers working with them were equipped with gloves and earplugs. Keiley said in a follow-up interview at the facility that his team will probably have to hang onto the birds while the investigation is pending, before they’re ultimately euthanized. “The animals we keep alive here are like bags of heroin kept in evidence,” Keiley said, adding that the process is wrenching. “It’s heartbreaking because we’ll be the ones who are going to be taking care of them day-to-day, but we know it’s better for them to be euthanized here than to die in the ring,” Keiley said. Though rare, cockfighting busts in Massachusetts are not without precedent. 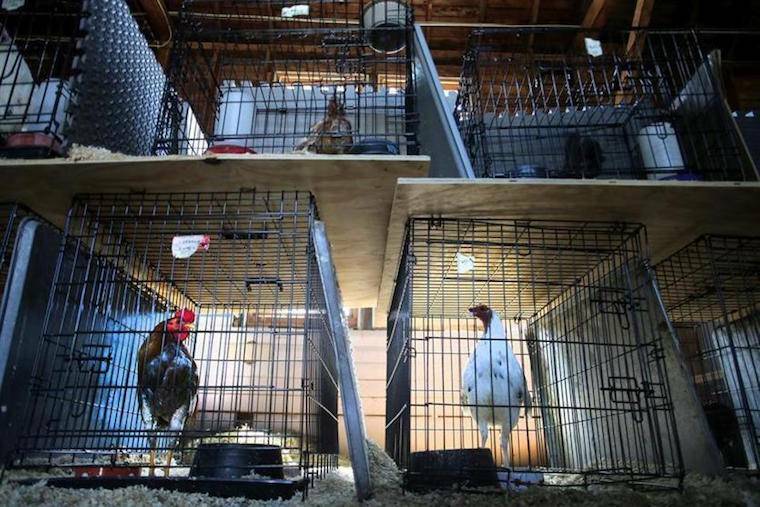 Halpin said the MSPCA has investigated six cockfighting cases in the state going back to the early 1990s, with the number of birds seized in those cases ranging from 50 to 200. “The Northampton case is twice as large as any previous case the MSPCA has seen,” he wrote. During a prior raid in Middleborough in 2005, police discovered cockfighting paraphernalia and more than 400 chickens and roosters on a 15-acre gated property. Investigators determined that a man on the property was supplying birds for “cockfighting enthusiasts,” a detective said at the time. In another case in 2016, 24 people were nabbed in Tewksbury for their alleged roles in a cockfighting ring that yielded 18 chickens with spurs on their feet, five of them severely injured. Police also recovered several packages of spurs, kits with tape, and over $13,000 in cash. Cockfighting is as brutal as it is secretive, according to animal rights groups. Bets on fights can range from a few hundred dollars to thousands of dollars, the ASPCA says, and roosters are even equipped with weapons. Though outlawed in all 50 states, the practice is classified as a felony in only 40, according to the ASPCA. Forty-three states have laws against attending a cockfighting event, and 38 bar even the possession of birds for fighting purposes, the ASPCA says. Thursday’s seizure of nearly 400 roosters was dwarfed by a raid last year in Val Verde, Calif., when nearly 7,000 birds were discovered in a remote canyon area, the Los Angeles County Department of Animal Care and Control announced at the time. Nationwide, an estimated 40,000 people participate in professional dogfighting, and cockfighting is believed to be “similarly widespread,” the Justice Department said in a statement last year. “In addition, animal fighting activities attract other serious crimes, such as gambling, drug dealing, weapons offenses and money laundering,” the release said. Karen Davis, founder and president of United Poultry Concerns, a Virginia-based nonprofit that runs a sanctuary for rescued birds, said in a telephone interview that gambling is a major factor in the allure of cockfighting, but not the only one. Emily Sweeney and Jeremiah Manion of the Globe Staff contributed to this report. For more information, visit Cockfighting.